Those exhaustive months are almost over. Two months since your delivery, you must have recovered from physical exhaustion to an extent. Also, you and your little one are now acquainted with each other. You are comfortable attending to her chores, and feeding her. So, what next? It is time to move to the next level. Wondering what it could be? Well, it is simple but effective. Introducing your little one to some activities, which have a long-term effect on her. 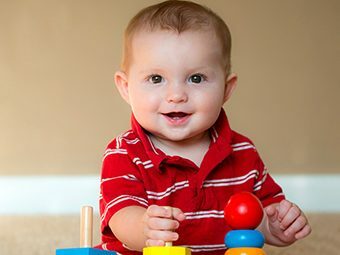 Activities for 2-month-old baby? Yes. MomJunction helps you with a list of activities you and your baby can engage in. Still surprised as to how a two-month baby can be active? You wouldn’t after we tell you about the milestones your baby could reach by two months. A two-month-old can turn to sides while lying on her back. She can move her hands and legs. She, however, needs support for her neck and head. The little one will begin to enjoy sounds and develop object recognition as well as hand-eye co-ordination. She starts communicating. It is important to choose activities suitable for the baby’s development. 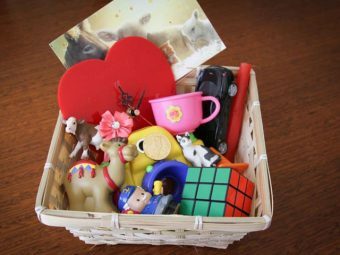 Here are some games and activities you can try. What to do: Hum and sing your favorite number for your little pie. Use varying dynamics in your voice as you sing. The baby tries to respond to your voice. She tries to concentrate while you sing. See if she is giving any cues in the form of facial expressions or movements to the varying pitches. What to do: Let your little one lie on a safe, flat surface. Take a soft toy and slowly bring it close to her from a distance. Move it from one side to the other so that the little one can follow it with her eyes. Gently wiggle or touch your baby with it to gain her attention. What to do: Turn on the music! Carry your baby carefully against your chest and make cool moves. Move around in sync with the music. Experts believe that the activity helps the little one develop an interest in music and strengthen the bonding with parents (1). What to do: Undress your little one to diaper and make her lie down on a safe, flat surface. Ensure that the room is warm and quiet. Now begin to massage in sections. Firmly, yet gently, stroke your baby’s legs, belly, and arms. Give her a nice massage on the back, and around the shoulders to strengthen those areas. Move the little one’s legs as if she were cycling. Clap her arms together or stretch them. The activity helps the baby feel the mother’s touch, which is very important for her overall development. What to do: Look at the tiny tot. Is she looking at you? Now, look straight into her eyes and smile. Wondering if your baby understands? Of course! She loves when you pay total attention to her. Each time your baby looks at your smiling face, encourage her to smile back by saying ‘smile’ and smile again. She will pick up the cues very soon. 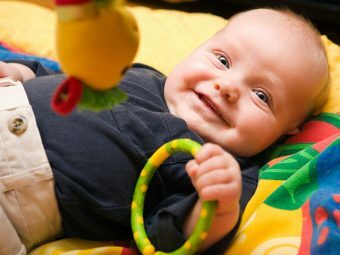 The activity is one of the fun things to do with a 2 month old and also helps the baby get social. You may also show family photos with smiling faces. What to do: This is very simple. Each time you pick your baby, give her a hug and say ‘I love you’. You may think she is too young to understand anything, but it will help her with emotional development and understand the importance of touch. What to do: Introducing her to the world of books helps in the development of cognitive skills. Sit down with your baby and place her on your lap. You can help her look at different picture books. Point out the pictures with bright colors and tell what each one is. If it is a story book, read aloud. It helps her develop language skills and concentration. It will also be one of her first learning experiences in vocabulary and speech. What to do: Hang a bright, colorful toy over your baby’s crib. Attracted by those bright colors, she will try to reach out for them. She will stretch her body in the process, giving her some physical exercise. Play time with toys having lights and music will keep her engaged. You may be surprised to see your little one swatting the objects. The sounds and lights aid in the sensory development. What to do: As your baby grows, it is important to give her enough tummy time every day. However, seek doctor’s advice before doing it. Tummy time helps her strengthen muscles and then she would slowly learn to roll over and move around. Note: Do not place your baby on the tummy for a long time at a stretch, as it can hurt her neck and back or make her feel uncomfortable. What to do: Take your baby out for some fresh air. Show her the sky, birds, trees, buildings, cars, or anything else. Once you start taking your baby out for a walk, point to different objects and tell what they are. What to do: Let your baby hold on to your finger for some time every day. It will help her connect with you and build an emotional bonding. It will also ease her senses. She will feel secure and stay calm, which would, in turn, improve her sleep patterns. What to do: Talk to your baby using facial expressions. Make sure that she hears you. Keep addressing her in between your conversation. She will understand that you are talking to her. You will be pleasantly surprised when she makes cooing sounds in response to your talk. Encourage her to talk more when she coos back. Talk as you continue with your daily chores. What to do: Take your baby out and let her see people. Take her along to family gatherings and get-togethers where she can meet different people and hear various voices. It will help your baby interact better with others and not get confused or scared. Remember: The places you take her to should not be too loud or crowded, as she may get agitated, anxious, and scared. Instead, keep the gathering easy and the surroundings soothing and calm. Let her enjoy as she learns to interact with others. What to do: A baby can learn a lot through her sense of touch. Therefore, lay her on different textured bed sheets and blankets to explore various surfaces. You can also strip your baby down to nappy if the temperature is warm enough. This will make her feel the surfaces not just with hands but the entire body. Remember: Supervise your baby for proper breath while carrying out the activities. All the activities mentioned above for a two-month-old are simple. It is likely that you are already doing a few of them. Continue the good job! Speak to your baby’s doctor to know what more you can do to help your two-month-old grow. Moms, what were your baby’s favorite activities at this age?